EAST PEORIA --- Mildred A. “Millie” Wiesehan, 86, of East Peoria, died at her home on Saturday, Dec. 29, 2018. She was born in Peoria on Aug. 20, 1932, to Earl and Anna (Staub) Stoecker. Millie married Norman Wiesehan on April 8, 1956; he preceded her in death on Oct. 25, 2011. She also was preceded in death by her parents; an infant daughter, Nancy Marie; 2 brothers; 1 sister; and an infant sibling. Millie is survived by her children: Martin (Jan) Wiesehan of Peoria, Eric Wiesehan of West Peoria, and Julia (Ralph) Marquez of Rochester, MN; as well as her grandchildren, Jeremy (Jessica), Joseph (Jennifer), Felicia, and Christina Marquez; and Matthew and Nathan Wiesehan; her great-grandchildren, Ezra and Levi Marquez; and a brother, Earl (Joan) Stoecker. 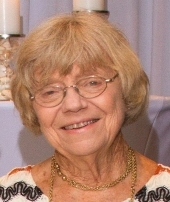 Millie was a member of Trinity Lutheran Church for more than 60 years. She was a dedicated volunteer with her church and many other organizations. Millie often visited her shut-in friends and stayed connected throughout her life with her childhood friends. She adored her family and traveled to visit her grandchildren and great-grandchildren as often as she could. She enjoyed spending time outdoors and caring for her yard and gardens. Services will be at 10:00 a.m. on Friday, Jan. 4, 2018, at Trinity Lutheran Church, with visitation for one hour prior. The Reverend Matthew Synnott will officiate. Interment will be in the Lutheran Cemetery. Memorials may be made to Trinity Lutheran Church or St. Jude Children’s Research Hospital. "Email Address" would like to share the life celebration of Mildred "Millie" A. Wiesehan. Click on the "link" to go to share a favorite memory or leave a condolence message for the family.